An Englishman's home was his castle, for Walt Kowalski (an American) the outer border of his castle is his lawn. He greets any attempt at incursion with a threatening stare and a raised shot gun. Kowalski sits on his front porch every day, can of beer in one hand, and gun lying over his lap supported by the other. An ex-soldier he looks out on a changing world, changing for the worse he thinks. His family are all fat wimps, investment bankers and girls desperate for ipods. His neighbours are gooks and chinks (his language not mine! ), all the Americans have moved out of his community. Like a Daily Mail reader with a gun, he sits there scowling at the universe which has moved beyond him. And all the time he feels pestered, in particular by a Catholic priest. His wife told said priest to save his soul, but Walt thinks that with his gun and his beer and his sacred lawn there ain't much soul to save- all that he needs help with is the scars from the wars he served the US in, and those scars are not going to be healed by a priest with all the experiences of a 13 year old straight from seminary. 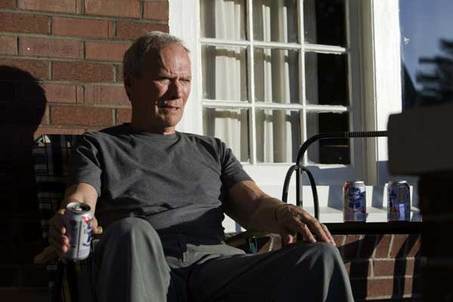 Gran Torino is a story about an image, and that's the image, Walt (played by Clint Eastwood) sitting on his porch, gun in his hand, beer in his hand and watching his Gran Torino and his lawn. So what happens? The dynamic part in this film is not some liberal dream- Walt doesn't decide he has fallen in love with his neighbours, nor is this a tale of religious redemption. Racial and religious softening do happen though but they happen within Walt's character, not against it. On the first hand, Walt's lawn and Gran Torino are challenged by a group of Asian youths who decide to steal his car, they recruit the unwilling Thao who lives next door. Walt disrupts this activity, takes on the youths, stops Thao stealing his car. He then is asked by Thao's sister Sue whether Thao can become his servant for a month, to expunge the disgrace of the theft. Walt recognises the values of this request and accedes to it, setting Thao to work on his own and then his neighbour's houses as a builder. Slowly a relationship between Thao, Sue and Walt develops: the relationship is built upon Walt's grudging kindness and their willingness to respond. Walt is still a racist- he still calls Sue dragonlady and Thao a gook- but he likes this dragon lady and values this gook. This is a fable about how racism can be overcome and it is not by losing racist attitudes, but by liking through the racist attitudes. The trajectory of Walt's religious views is similar. Again experience comes to certify that the great lesson of Christianity, to turn the other cheek, is true. Walt begins this film as a pagan war god. When Sue is attacked by some black kids and her white boyfriend can't handle it, there is Walt scowling in the car threatening to shoot the kids' brains out with a very plausible sneer. The gang that persecutes Thao are humiliated once and again by Walt's ability to cow them with a glance and threaten violence they find shockingly plausible. And yet, what Walt does is merely fuel a cycle of violence that comes back. In the age old conflict, Gran Torino is a film in which the men of the long robe victor over the men of the sword: the priest is ultimately right about revenge and the story of the film proves to Walt that this is so. Christianity here is the revolutionary force that it was when it emerged: a creed which advocates non-violence and forgiveness even in the worst circumstances and in that sense the end of Gran Torino is truly Christian. There is a last set of ideas that the film plays with and those are about masculinity. Throughout the film, Walt plays the role of an assertor of a particular type of masculinity and by the end of the film he has everyone's respect. That masculinity is assertive, hostile and defensive. It is shaped by war. It is both barbaric and heroic. His sons have become true Reagen Americans, softer, concerned with respectability and wealth. Thao's decision between Walt's masculinity and that of the gang that torment the community is an easy one- it is the decision between constructive and unconstructive heroism. The film has two messages about this decision: the first is that Walt's masculinity is the only one that offers Thao a route out of the problems that he confronts. A young boy with an immigrant heritage pestered by gangs needs strength and the ferocity to take those gangs on, he needs bravery and skills. Equally though Walt's masculinity is inadequate: one of the funniest scenes in the film has Walt teaching Thao how men speak to each other, it is a foreign language for Thao and for most men. Ultimately Walt's masculinity is that of the hero, the uncivilised and damaged hero, it is enough to get out of the world of the slum but not neccessarily enough to enter into or create civilisation. We have three strands- race, religion and masculinity- all coming together into this film. Within each notice the opposition between Walt's protective figure with his beer and his gun and the reality of urban civilisation. The world we have created was created by people like Walt, fought for by people like Walt, but cannot be lived in by people like Walt. The lesson of Gran Torino is ultimately the lesson of There will be blood, the world of Walt is fading, that of religion and liberalism supplants it and the gods of the copybook headings for a while withdraw to their caves. Again the point seems logical, but why bring up Socrates? There are two reasons for so doing- the first is a simple historical reason. Socrates did refer to his daimon who helped him solve problems (the Greek daimon has the same etymological route as our demon but not the same sense). But Kant doesn't just do this for a historical reason: he is interested I think in doing something else. Part of Kant's interest lay in discussing what reason was and how much it could do. Socrates was the first proponent of the idea in Plato's dialogue that reason could do almost anything: for Plato's Socrates to behave badly was to make a mistake, to behave well was to think well. These points about Socrates being the epitome of common sense suggest to me that Kant was offering a reappraisal of Socrates's project. His marginal comments were a reminder that even Socrates had not been able to purely reason- even his thought was derivative from oracular outbursts and common sense observations. The little mentions of Socrates are Kant's way of suggesting to his reader that philosophising about some subjects starts from commonly agreed principles and cannot be a priori- as even the father of a priori philosophy was himself the servant of the daimons of his past. In the previous series of posts we have looked at Gladstone’s political thought from his pragmaticism to his opposition to government spending. Now we are to look at some of his actions. 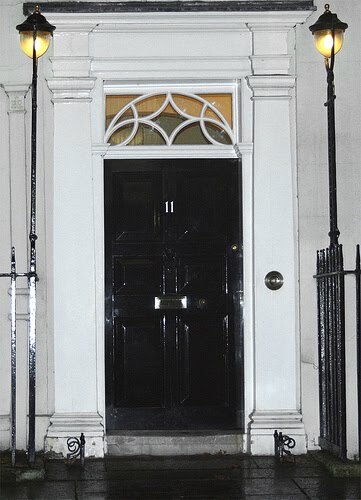 In particular we are to look at his hugely important tenure as Chancellor of the Exchequer. There has been a lot of focus on Gladstone as prime Minister. His chancellorship is I’d say much less known. And it was in this period that he fundamentally moved to “liberal” viewpoint and left behind fully his High Tory past. It’s his tenure as one of Britain’s most important Chancellors ever that he forged the power that made him Prime Minister he would never have become Prime Minister. 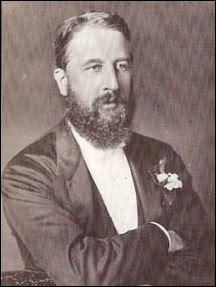 He was probably the most important single chancellor of the nineteenth century. This can be seen in a number of ways. Firstly he simply changed the economic and fiscal policy of the United Kingdom the world’s preeminent economic power. Partly this was through the constant application of “economy” and expenditure control. Gladstone’s accession to the Chancellorship marks a halt for several decades of what was otherwise a continuous century’s long increase in regular expenditure and borrowing. In a sense Gladstone’s chancellorship and its imitators (of both parties) managed to halt Gladstone managed to apply rigorous expenditure control. This was combined with a switch away from direct taxation (such as income tax) –though Gladstone’s economy measures were enough that he still cut the income tax in several budgets in the 60’s having previously raised it. It was in indirect taxation that there was a sharp downward trend. Perhaps the most significant single tax change was the abolition of Paper duties which helped spark a massive boom in the British (particularly the provincial) press. Britain was seen then (and since) as the epitome of free trade ideology and France as a relatively and somewhat ideologically Protectionist state. The cynic might say that it was inevitable that the fiscal reality was that Britain’s real tariffs were higher against France’s than vice versa –because their restrictions on wine were on a major import while France’s tariffs were overwhelmingly on relatively minor imports . Gladstone used the treaty to push down trade barriers. But it also represented an early version of his “Cobdonite” international vision whereby trade and international agreement could replace military force and empire ( much more enthusiasm of the great Liberal though barely liberal statesman Palmerston who was Prime Minister for much of this period). It did indeed spark a whole series of multilateral trading treaties-though ironically some argue that in turn helped inaugurate the end of the free trade era. From a longer perspective the modern Treasury was also in large part the product of Gladstone’s Chancellorship. The institutional obsession with a balanced budget and low spending that lasted well into the twentieth century (and many would argue well beyond) owed a great deal to the powerful ethos of Gladstone. Similarly The modern Chancellor’s budget – in it’s use as the single seminal moment of the fiscal year ( which has started breaking down in recent years) is in many ways the product of Gladstone’s desire both to control the whole fiscal operations of government as a cohesive whole and his public showmanship. Finally dominance of the treasury among departments and control over spending dates in it’s fullness from this period. One reason why Gladstone was able to have such massive and lasting policy and institutional effects as Chancellor was his huge political success. His economic agenda was genuinely popular. IT’s worth remembering that taxation was regressive in this period and very little expenditure whet on welfare (and that which did was mostly the poor law whose recipients were disenfranchised). Gladstone’s reforms represented a direct rise in the real incomes of virtually all voters and most adults-and were rewarded at the polls. Similarly the burden of debt through taxation (from the Napoleonic war) had caused strain for decades so minimising it was cherished. There was a widespread political demand to keep taxation and debt low. What was at least in part new was that Gladstone achieved enormous political dividends through the assurance that he would actually deliver on such demands. Partly for this reason his chancellorship also saw the liberal party change from a coalition of somewhat free trade groups to a party (it was coalescing in this period) where free trade was a supreme dogma. Free trade sentiment even experienced a strong pull on the Conservatives – though they had more or less abandoned protection towards the early 1850’s just before. However it was though the fiscal, political and perceived economic success of Gladstone’s chancellorship that a very strong consensus was forged across the parties on the permanence of free trade-the elections of the 1840's had contrary to myth been far from unambiguous on the subject. This consensus was not to be shaken till the 1880's , not to be broken till the 1900's and not to lead to the formal abandonment of free trade till the 1930's and the National Government inaugurated a new era of “preferential trade” that lasts till this day. Gladstone did not only increase free trade directly but indirectly through building a new fiscal architecture with free trade as a fundamental building block. The popularity of Gladstone’s record also made him a huge popular and public figure in a way he had not been before. He nurtured this through the provincial press. This was strongly sympathetic to him-partly because his abolition of paper duty had been of such economic benefit to them and partly because of it’s ideology-it was mostly strongly liberal in a rather “Gladstonian” way. There was also of course a role for great national papers including the new rising star of the media firmament-the Telegraph. Gladstone gave a large number of speeches in this era including in the provinces. These were extensively reported by the press and in combination with his record built up a huge political following. It was this following that was to make him Prime Minister. It was because of this that when Russell retired in 1866 Gladstone was the inevitable successor. This was not because of his support among the Parliamentarians of the Liberals , among whom he was respected but also regarded as eccentric and increasingly as excessively radical. It was because his public profile and support was so much higher with Russell gone than any other liberal mp that he was the inevitable candidate. Thus for a whole number of reasons Gladstone has to be regarded as a monumentally important Chancellor up there , David Lloyd George, Neville Chamberlain and Gordon Brown. Indeed he arguably exceeds them all in importance. 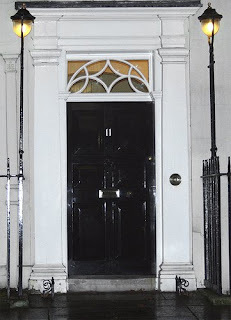 This is a picture of Number 11 downing Street- the residence of the office-the Chancellor of the Exchequer which owes so much of its modern importance to Gladstone.